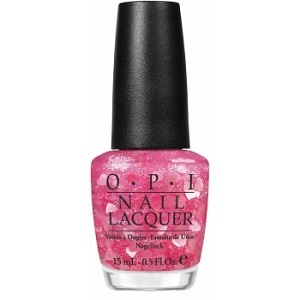 OPI Nail Polish, Nothing Mousie 'Bout It, NLM13, .50 fl. oz. Glitter topper with pink, lavender and gold micro-glitter mixed with larger scattered heart shaped glitter in a thick, sheer, pink-tinted base. OPI Vintage Minnie Mouse Collection.